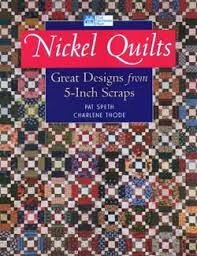 That Patchwork Place Nickel Quilts-Great Designs from 5 inch Scraps. Discover a sensational system for using your scraps! It's scrap quiltmaking at its best--stunning traditional patterns, a rainbow of gorgeous colors, and an all new approach to making scrap quilts that sparkle. Start by cutting 5" squares from your stash fabrics. Once you have your stack of squares, half the work-the cutting-is done! Choose from 20 big, beautiful patterns that each include directions for three different sizes. Use just eight units to make every quilt in the book;then mix and match them into dozens of other creative settings. Have a collection of different sized squares? Don't worry- alternate sizes are given for 4" and 6" squares, too. Learn trouble-free techniques for making half-square triangles, four-patch units, and more.